PARIS (Reuters) - Airbus is nearing a decision to axe production of the world's largest airliner and may give an update with full-year earnings on Feb. 14, industry sources and analysts said. "The A380 is the elephant in the hangar; it will be impossible to avoid saying something on the subject," said Agency Partners analyst Sash Tusa, who predicted last week that a decision to shut the loss-making program may be imminent. 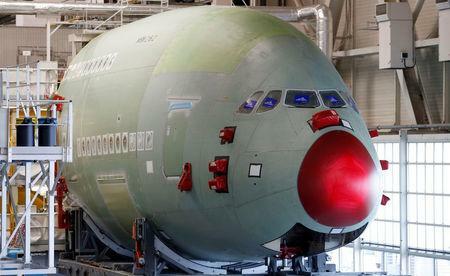 The A380 is already on life support due to weak sales. Barring a surprise breakthrough in stalled engine talks between Emirates and Rolls-Royce, the A380's French and German factories are unlikely to survive beyond 2020, analysts say. Airbus declined to comment ahead of Thursday's earnings.